I hooked up with Emma and Paul on a wild, windswept day at Druridge Bay on the Northumberland coast. I was looking for couples who were up for a laugh and willing to try out some of the crazy photography experiments I had in mind. Emma and Paul were good sports and were super patient as I brought on smoke bombs, prisms and tried a Brenizer panorama. They were so easy to get along with that it was only towards the end of our session did I discover that both Emma and Paul were very nervous about being in front of the camera. This is a very common issue with couples, and to be honest, you'd have to be amazingly confident, or a complete crackpot, to want to be performing in front of the camera. The majority of couples I work with on couples sessions, or weddings, feel the same way. You might, therefore think that dodging a pre-wedding shoot is the way forward, and indeed some couples do this, putting off their photographer until the wedding day. The problem with this approach is that it puts off a little bit of discomfort now only to go through more pain on your wedding day. The worst case scenario is that you are a bag of nerves on your wedding day, working with a photographer you don't get along with and convinced that you'll look awful in your photographs. At least if you've had an engagement shoot before the wedding you'll have had a chance to build up a relationship with your photographer and see how they work, you will have seen how they photograph you and you can have confidence that your photographs will look great, plus you'll feel calmer on your wedding day because you know what to expect. Fear of the unknown is often far worse than the reality. 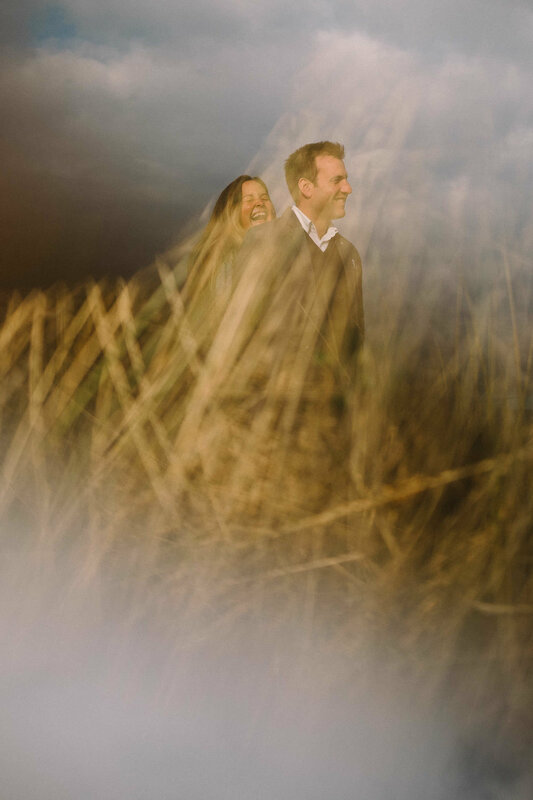 That's just a few of the reasons Emma & Paul enjoyed their pre-wedding session and can look forward to their wedding day without feeling nervous about their wedding photography. If you'd like to see other pre-wedding and engagement shoots in Northumberland check out my Northumberland weddings page.